After four days of whirlwind activity, I’ve returned from the 2018 International One Health Congress (#IOHC) in beautiful Saskatoon, Canada. Insight, inspiration and networking were in abundance at the biennial conference, which drew more than 800 participants from 60 countries to hear renowned experts and researchers in One Health. It was a privilege to share the work of the UC Davis One Health Institute (OHI) and PREDICT. 1. There is so much to do that would benefit from a One Health approach by all of us working to solve global health challenges. Concern about competition for limited resources was raised more than once at IOHC. It’s important to remember that the challenges of the problems are vast and demand a concerted response. Our efforts are best served in synergy, as a community. Diverse strengths, skills and disciplines are needed to arrive at the most effective solutions, so we should all get busy and encourage one another. 2. Sessions presenting new initiatives, such as the Global Virome Project, generated animated discussions. EcoHealth Alliance President Peter Daszak presented on the scientific and economic rationale for the Global Virome Project. 3. The security sector has an important role in One Health and infection disease protection. I was excited to see the session on global security and biological threats. 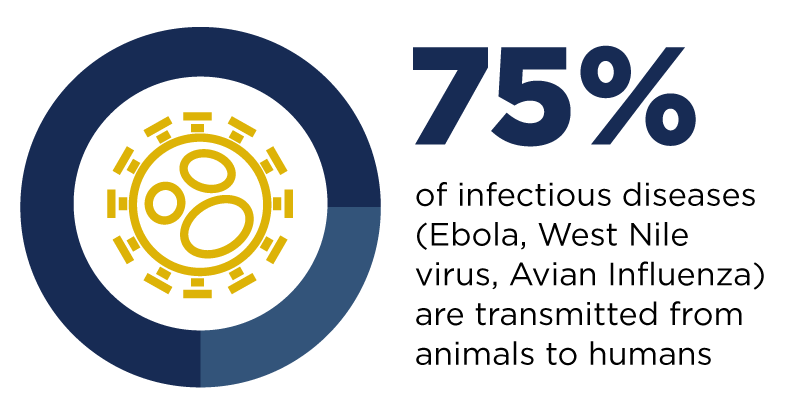 The One Health community’s embrace of the security sector will help improve biosafety and security, as well as the tracking of infectious agents. And that brings the world closer to effective preparedness, echoed in a press statement by the One Health Congress. 4. An African-focused congress is shaping up for 2019. First proposed at the 2016 IOHC in Melbourne, an African-focused congress is planned for 2019. It’s encouraging to see the One Health community recognize the unique challenges that African nations face. How can we better engage and involve our partners from environmental disciplines? The role of the environment is a critical part of the One Health approach and has a significant effect on both human and animal health. Reaching out to environmental partners involved in planetary health will strengthen participation in future One Health activities. 6. The future of One Health leadership looks bright. Seeing the posters and presentations from graduate students and post-doctoral fellows of all disciplines — including those from our OHI team — left me feeling proud, re-energized and confident in the next generation of One Health leaders. If you missed IOHC 2018, there’s plenty of time to save the date for the 6th edition in Edinburgh, Scotland, in 2020. I hope to see you there. Tracey Goldstein is Associate Director of the One Health Institute at the UC Davis School of Veterinary Medicine and Professor in the Department of Pathology, Immunology and Microbiology. She oversees the One Health Institute Laboratory and Marine Ecosystem Health Diagnostic and Surveillance Laboratory, is Co-Principal Investigator on the USAID funded PREDICT project and leads the pathogen detection and laboratory capacity building objectives for the project.